You'll be £32.00 closer to your next £10.00 credit when you purchase British Naval Weapons of World War Two. What's this? John Lambert was a renowned naval draughtsman, whose plans were highly valued for their accuracy and detail by modelmakers and enthusiasts. By the time of his death in 2016 he had produced over 850 sheets of drawings, many of which have never been published. These have now been acquired by Seaforth and this is the first of a planned series of albums on selected themes, reproducing complete sheets at a large page size, with an expert commentary and captioning. 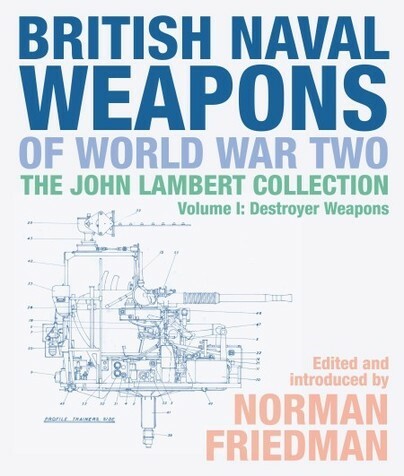 The initial volumes will concentrate on British naval weaponry used in the Second World War, thus completing the project John Lambert was working on when he died. His interest was always focused on smaller warships and his weapons drawings tend to be of open mountings – the kind that present a real challenge to modelmakers – rather than enclosed turret guns, but he also produced drawings of torpedo tubes, underwater weapons, fire-control directors and even some specific armament-related deck fittings. This volume covers all such weapons carried by British destroyers of this era, with additional appendices devoted to earlier guns still in service, and destroyer-calibre weapons only mounted in larger ships. The drawings are backed by introductory essays by Norman Friedman, an acknowledged authority on naval ordnance, while a selection of photographs add to the value of the book as visual reference. Over time, the series will be expanded to make this unique technical archive available in published form, a move certain to be welcomed by warship modellers, enthusiasts and the many fans of John Lambert’s work. This is an astonishing title with a wealth of unique reference material all in one place – with more to follow in the series! ... to be welcomed by warship modellers, enthusiasts and the many fans of John Lambert's work. The amount of detail in these plans and the quality of their drafting is a joy to behold. John Lambert was one of the finest naval draftsmen in recent memory, and the presence of his drawings automatically enhanced the value of any book. The presentation by Seaforth is superb.